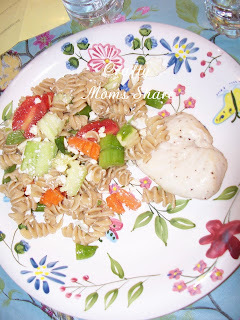 Hazel and I made some pasta salad last night. 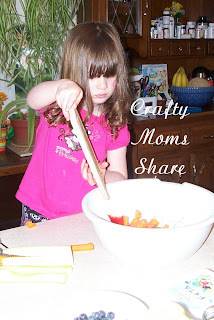 This is a fun recipe since Hazel can chop most of the vegetables we like in it. I love having it since it makes such a great lunch afterwards. I cooked up a pound of whole wheat fusilli pasta (I love Trader Joe's brand) and let it cool. I prepared the vegetables for Hazel. She chopped zucchini, red pepper, carrots, and cucumbers. I also chopped celery (her chopper isn't quite sharp enough to deal with the strings), grape tomatoes, snap peas and fresh oregano. Then we add the juice of one lemon and some olive oil and some feta cheese (I use the fat free version) and a little ground pepper. Then mix it all together! You get a yummy dish either a side or main dish which is perfect for the hot weather! 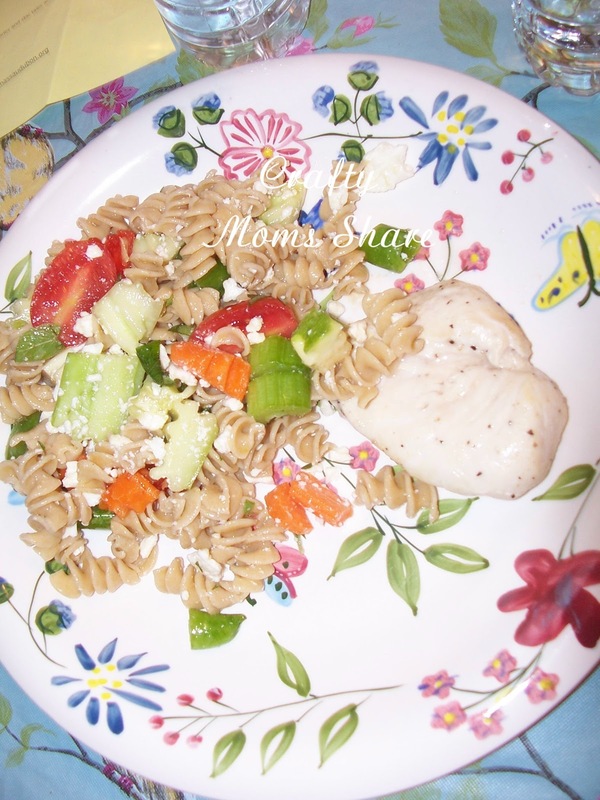 We had it last night with chicken breasts (and I have been known to cut up the chicken and put it right into the pasta salad as well). 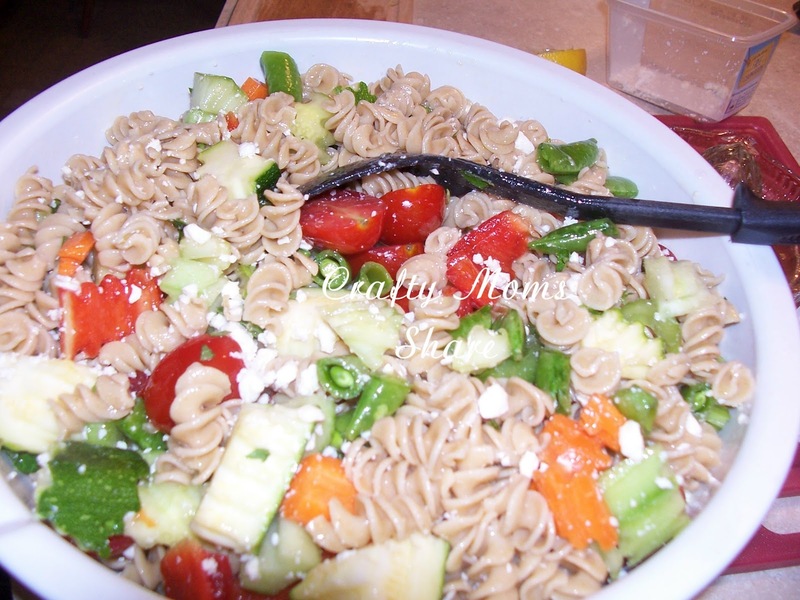 One of my favorite things about this recipe is you can use the vegetables you and your family like or whatever you need to use up in your refrigerator. 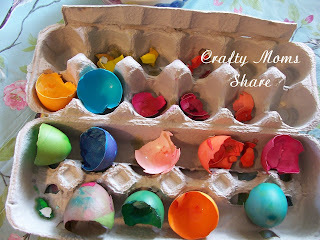 We of course started by dyeing the egg shells--well at least the white and brown egg shells. We left the blue ones blue. 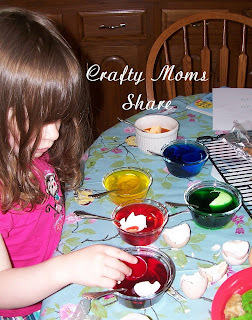 This of course was very exciting to Hazel and she managed to make a huge mess spilling dye everywhere twice. I did my best not to lose my patience, but was not completely successful. Then once the shells were dry we took them outside with some paper and glue. I put glue down in the shape of a flower and Hazel wanted a sun on it so I added that. Then we started breaking the egg shells and putting them on. Then Hazel added some glue to be grass and something else. Then she finished it up. She enjoyed this activity but her favorite part was dyeing the eggs. It did not come out as neat as I had seen on-line, but again she is three and I let her do what she wants. 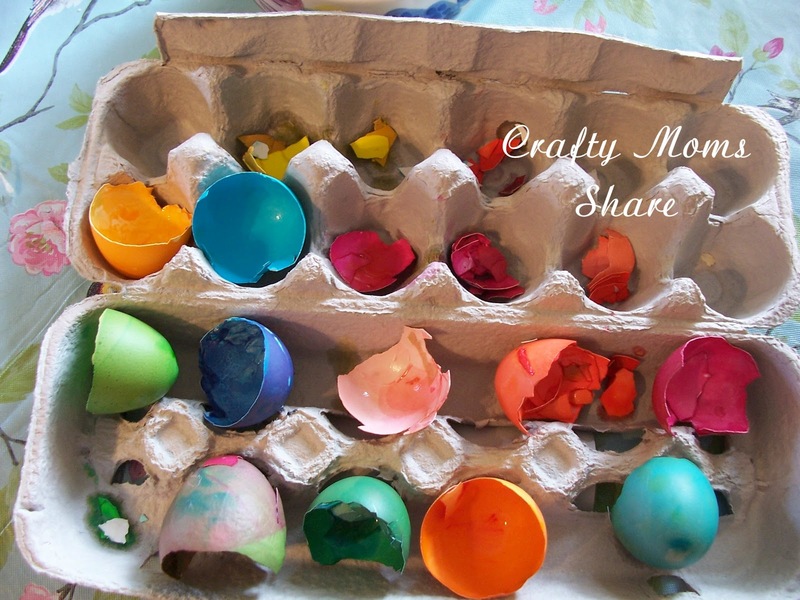 This is such a great way to reuse the shells! 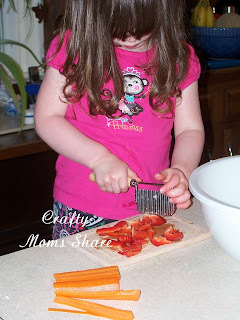 what a handy tool she is chopping with!! thanks for linking with kids in the kitchen! That salad sounds just right for spring! 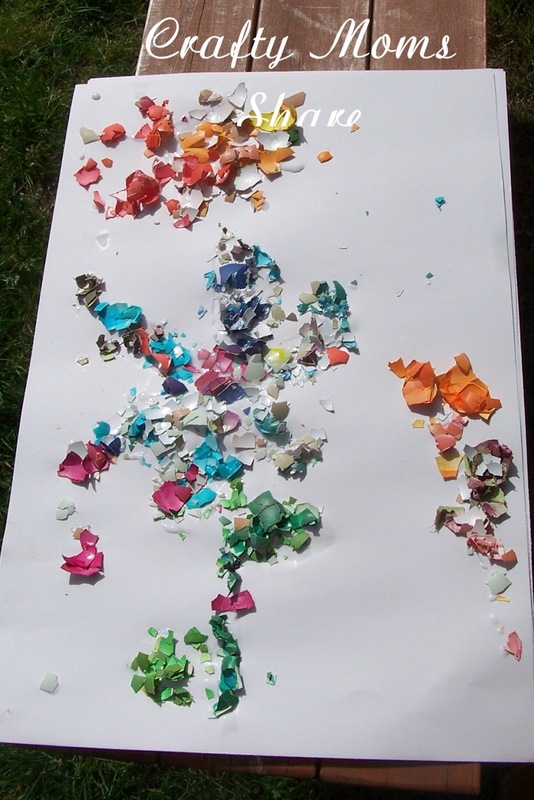 And we did egg shell art a little while ago (but I know others have too). Thanks again for sharing at Happy lil ❤'s are baking! 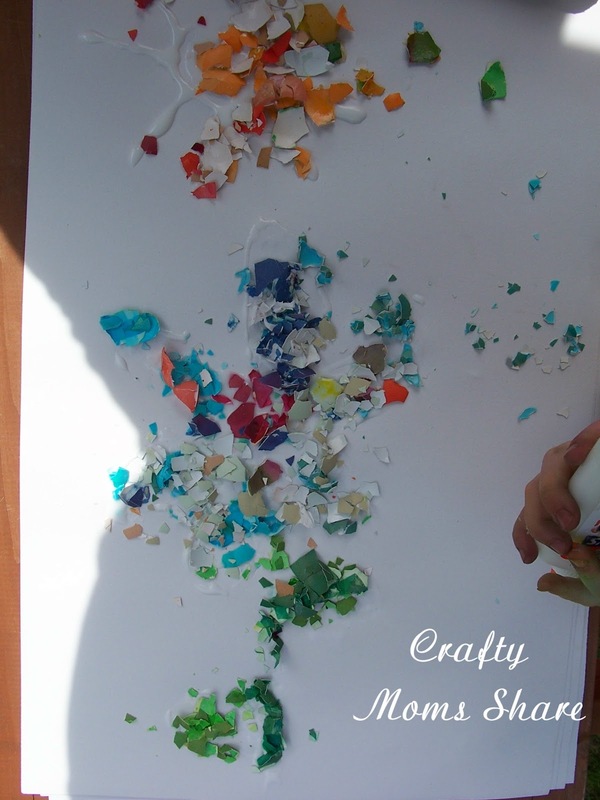 I love the egg shell art idea! Thank you so much for posting on Saturday Show and Tell. I hope you’ll be back this week. Also, this would go great with the Summer Activities for Toddlers. I would love it, if you shared it there as well. 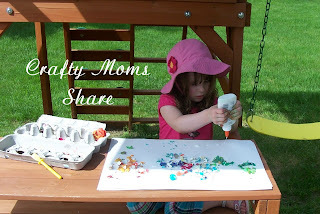 (http://www.cheeriosandlattes.com/summer-activities-for-toddlers) Thanks.